"This is a powerful image. Thank you so much!" 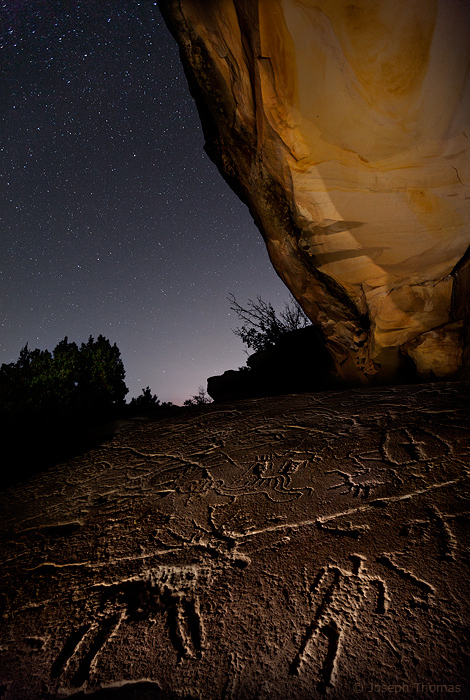 Ancient rock art adorns this sandstone slab in the canyon country of Western Colorado. It is speculated that some of the figures are Shoshone (Ute) and that some may be from the Fremont culture or even older. These illustrations are actually barely visible in direct light. But by placing my headlamp directly onto the rock and skimming light horizontally across the surface, I was able to bring the topography to life. Your mind might perceive the figures to be raised if you think the light is coming from the right. Only when you know that the light source is coming from the left can your mind correctly perceive that the images are etched into the stone. Moonlight illuminated the canyon wall.